The display/cost formula is off by quite a bit--you may want to look into that. 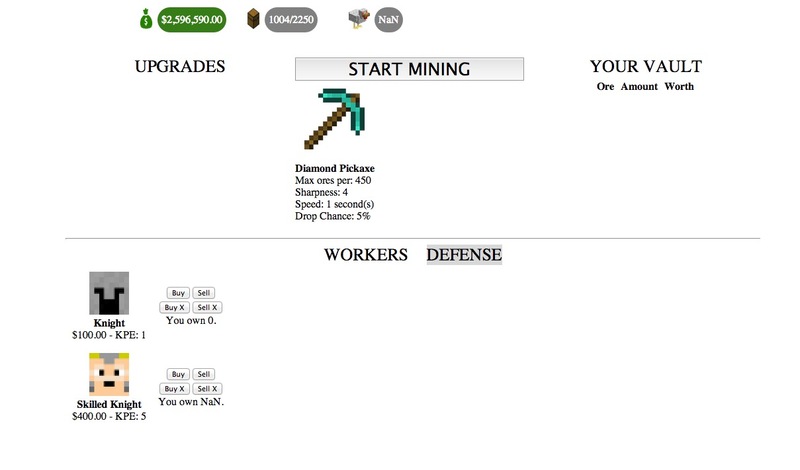 The prices that are displayed for buying the miners doesn't seem to be matching up with the actual amount it is deducting. Perhaps if some of your knights died during the battles, so that you have to keep buying them, and also if you won money for winning a battle, to make it more interesting? As for soldiers dying, I was going to add that but it got really late last night. I'll add it in soon as possible. I'm glad you're liking the game. I have 10,000 knights. How long should that hold out? Well in the next update, your soldiers will actually die in battle. And I will make it so after every 5 attacks by Don Chikolio, the rate of soldier production of his army increases a little bit more. What if we agreed to be business partners with Chikolio and we want to stop being business partners with him? There really isn't a way to get rid of chikolio, but I'm going to add in a really expensive upgrade that lets you pay him "off". I can't buy the Insurance and I have 20 milion. Can you give a link or something to the source code? Insurance does not have a purpose yet. I have not added another boss after Chikolio, but I'm always open for ideas. Maybe add..Thief, like an Enderman, you can get rid of Chikolio by getting a furnace and cook him? And after him there is a Thief, a Enderman, he steals you money but when you defeat him in battle he gives you pearls and you use those pearls to kill him, what do you think? First, when you leave the page does your progress save? Second, where can I see the code??? Your progress should save every 15 seconds. If you want to make sure without risking it, open the game in another tab to see if it starts you off near your current progress. As for the source code, you should already be able to see the source code. Just view the page's source with your browser. After choosing to be business partners with Don Chikolio, you purchase the "Part Ways" upgrade. After every attack by Don Chikolio, the rate he produces soldiers increases. 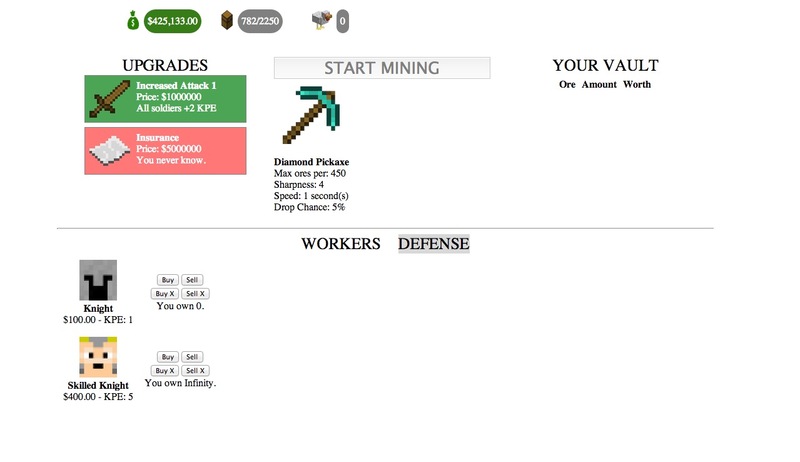 Automining no longer displays ores mined or ores in your vault (page will stop randomally moving now). How long should 150,000 Knights and 100,000 Skilled Knights last? But there will be a point were Chikolio will reproduce troops so fast that you'll need more than that. This is a very fun, and addictive game. Can't wait to see what you do with it. How do I unlock the Defense thing? ^n (price of the 1,000,000th Knight would be ~15K, with the cumulative cost for all 1m being ~5.9B, with n being the number currently owned), so we can't go and buy a few million of them every hour, while still allowing a large amount without breaking the number system. @Water tripper, just click Defense. I see the potential that this little game of yours has. Keep up the good work. Whenever I click the Defense button it just says I haven't unlocked the feature yet. Everything else is max upgraded. Love it. Will implement it in the next hour or so (I r hungry). You unlock the defense tab when you meet Don Chokolio. Have you got to him yet in the game?